The transformation of our corporate offices is complete. The Aubuchon Team of Companies recently renovated the exterior of their headquarters located at 4707 S.E. 9th Place in Cape Coral. The building offers an entrance from the roadway, as well as an entrance from Club Square, a hub of local activity, including the Cape Coral Farmers Market. The building has a fresh, new look with a contemporary flair. 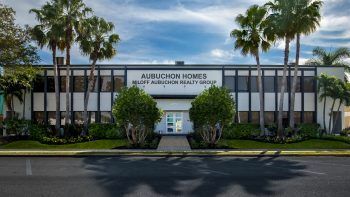 Aubuchon Homes and Miloff Aubuchon Realty Group are known for offering comprehensive services for luxury living, so the building is home to several other businesses including Evalutions by Aubuchon an interior design firm, OmniOne Title Services, Mortgage One, and McGriff Insurance Services.